Fast Shipping, Made in USA, Transferable Lifetime Warranty, Wind Certified to 130 MPH! At Vinyl Fence Wholesaler, our commercial grade heavy duty railing systems are considered the highest quality Stair railing, deck railing and porch railing, by builders, contractors, and homeowners alike. All railing we manufacture is BOCA approved and code certified for all residential and commercial railing projects. 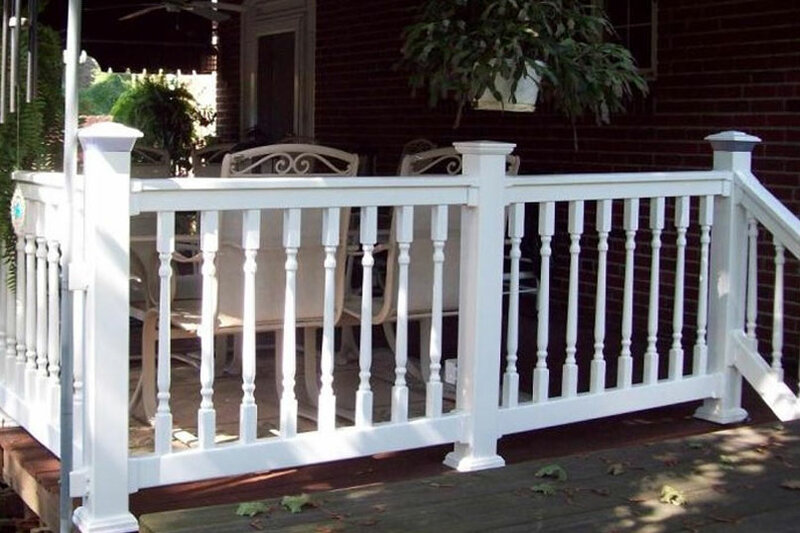 We provide everything needed to complete your stair railing, porch railing or deck railing project. Our railing ships fast! Most orders are on the road within 48 hours! 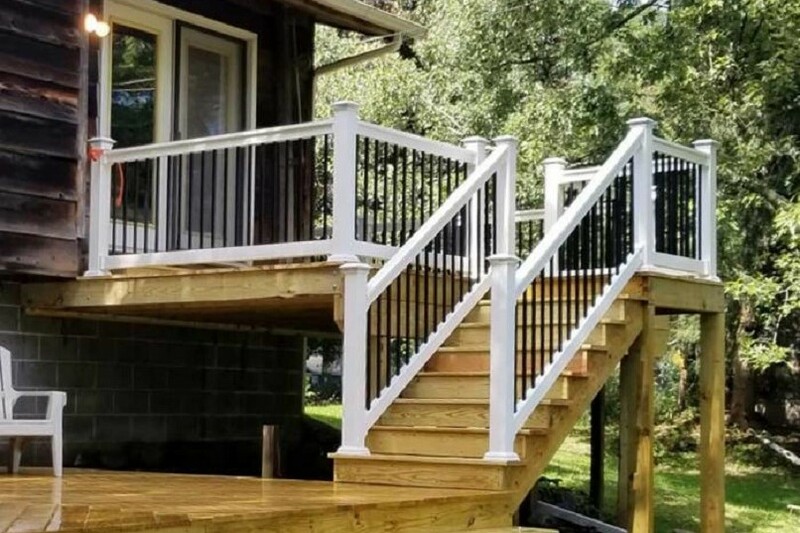 All of our vinyl railing, stair railing, porch rail and aluminum deck railing panels include all brackets and mounting hardware, plus we have post mount kits for every application. Backed by a lifetime transferable warranty, the strongest warranty in our industry, our commercial grade vinyl railing adds actual value to your project. View our large selection of railing systems below. Purchase Factory Direct and Save! On Sale Now. Fast Shipping. Click Here or Click picture below for pricing and details. The Cardinal Vinyl Railing System features 1.5″ x 1.5″ square balusters as well as our commercial grade heavy duty 2” x 3.5” top and bottom rails. Top horizontal rails are reinforced with aluminum for commercial strength. 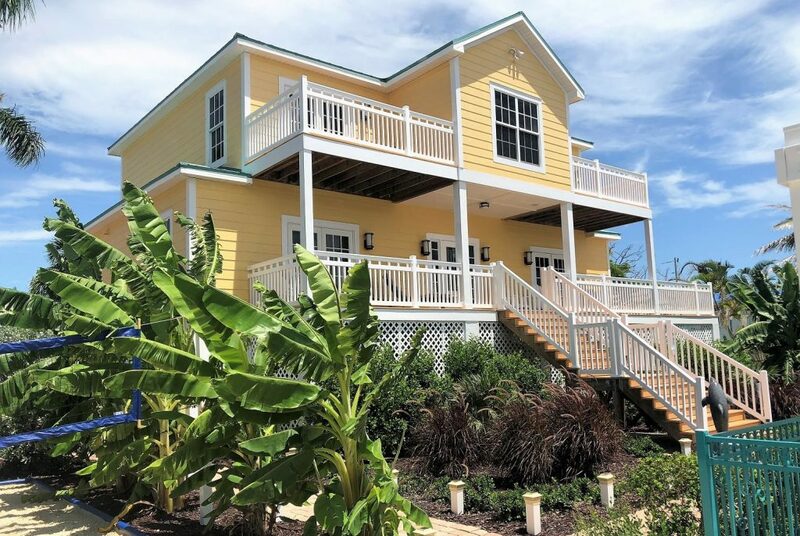 All of our deck railing, porch railing and stair railing systems, are national building code approved for all commercial and residential applications. Cardinal railing includes all fastening brackets, instructions, and as always free 24/7 installation support. Available in tan, clay or white color options and various sizes to choose from. Our Winston Vinyl Railing System combines our 1.5″ x 1.5″ square spindles with our heavy duty molded T-rail top rail reinforced with aluminum for a contemporary look and commercial strength. Winston railings are also easy to assemble, include all brackets and instructions necessary, in addition to a customer service team that is available 24/7 to offer any support you may need including installation support. All of our vinyl railing systems are available in a variety of colors and sizes and backed by our industry leading transferable lifetime warranty. Similiar to Winston Railing, Sefton Railing uses our code approved rectangle balusters 7/8″ x 1 1/2″. As well includes our heavy duty molded T-rail top rail reinforced with aluminum for commercial strength. Sefton railing system is available in two standard heights: 36″ and 42″. Sefton is easy to assemble, includes fastening brackets, detailed instructions plus 24/7 install support. As always, all railing is 100% backed by our industry leading tranferable lifetime warranty. Miami railing systems include a decorative accent just below the handrail for a distinctive look. 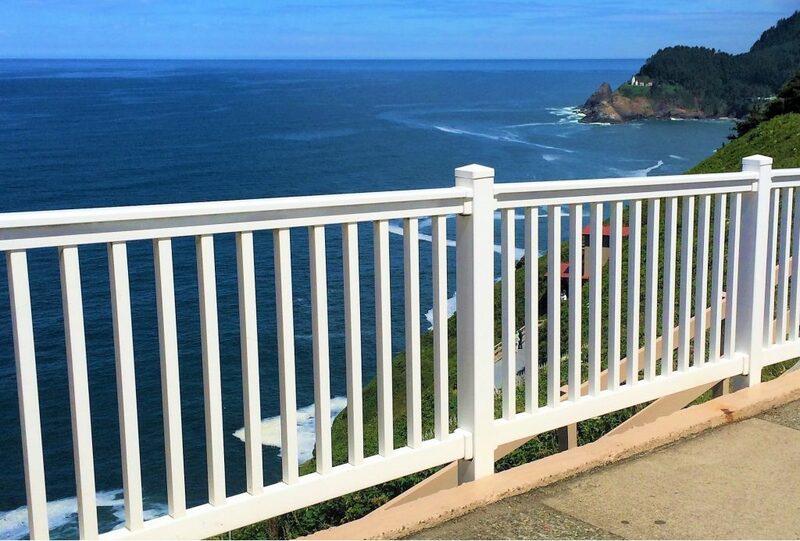 Manufactured from the same premium quality vinyl as all of our raling, our Miami Deck Railing and Stair Railing systems are available in 42″ height and BOCA approved. Miami Railing is a complete railing system. Includes all brackets and hardware and is easy to install. Each order includes detailed step-by-step instructions, plus, as always, free 24/7 installation support. 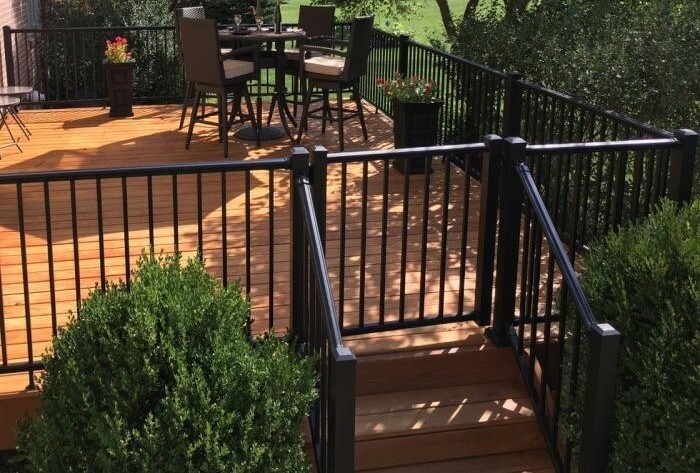 Beaumont railing combines our molded T-rail top rail with Black Round Aluminum Balusters. A classic piece that will be the perfect addition to any patio, porch, or deck, Beaumont railing is perfect for your home or commercial railing project. As per all of our railing systems, Beaumont railing system is easy to assemble and includes all of the instructions and brackets necessary for installation. Beaumont railing is available in tan, white or clay colors, both Top and Bottom Horizontal Rails are reinforced with aluminum for commercial strength. As always we provide customer service available 24/7! Houston Railing uses our Black Square Aluminum Balusters, everything else is the same as our Beaumont Railing. T-rail top rail plus our 2″ x 3.5″ heavy duty bottom rail. Both Top and Bottom Horizontal Rails are reinforced with aluminum for commercial strength. All of our deck railing systems are code approved for international commercial building code IRC, and residential building code IBC. 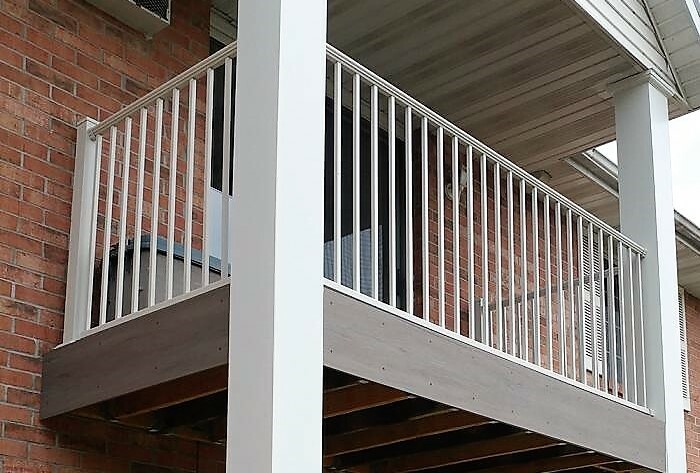 The Houston porch and deck railing system is both a beautiful and convenient addition to your project. 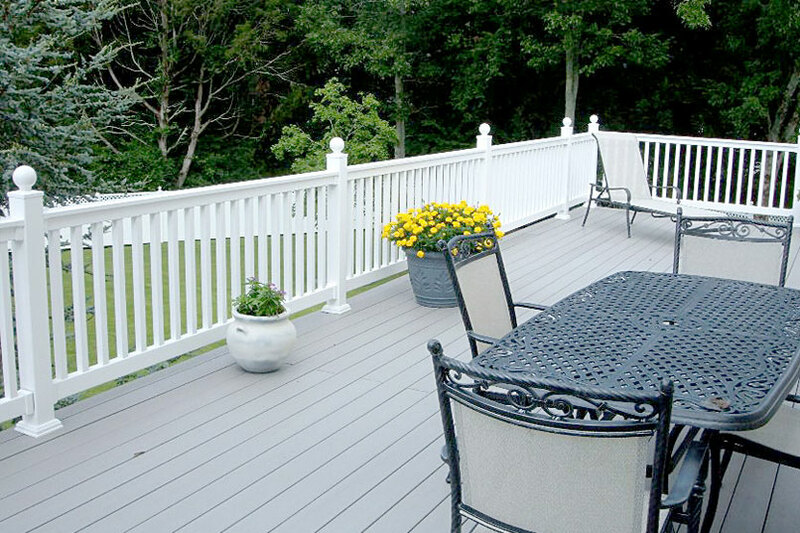 Select from our tan, white, or clay color options to find the perfect deck railing system for your project! The Boston Railing features decorative turned spindles, a classic look with 2 x 3.5 top and bottom rails. Boston is available in either 36 or 42 heights. Our Boston Vinyl Deck Railing System includes heavy duty aluminum inserts in top rail for commercial strength combined with our heavy duty brackets, tested to AC174 standards and polycarbonate. This system is International Residential Code Compliant. (IRC) and tested in accordance with ICC-ES AC174 standards. Evaluated by PEI, Inc. Code Compliance Report PER-08032. Available in white, tan, or clay. The Salem vinyl railing system features decorative turned spindles. This clean look uses our molded T-Rail top rail and our standard 2 x 3.5 bottom rail. Salem is available in either 36 or 42 heights. It includes heavy duty aluminum inserts in its top rail for superior strength. Its brackets are tested to AC174 standards and are polycarbonate. The system is International Residential Code Compliant. (IRC) tested in accordance with ICC-ES AC174 standards. Evaluated by PEI, Inc. Code compliance report per-08032. It is available in tan, clay, or white. Minnesota Alumium railing system is a heavy duty commercial grade aluminum railing available in black or white color options. It provides a crisp, clean look, pairing a bread loaf top rail (1.645 in. x 1.720 in.) and a square bottom rail (1.250 in. x 1.375 in.) with 0.60 in. square pickets. 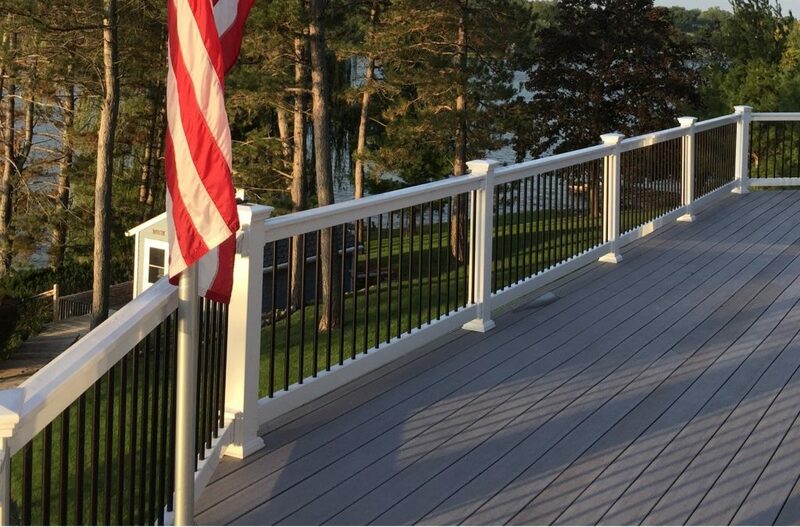 Minnesota Aluminum Railing combines the weatherability,strength, and low maintenance of aluminum while exceeding nationwide (IRC/IBC) building codes. Easy to install and assemble, includes all fastening brackets with hardware, plus detailed instructions. Contact us for free 24/7 installation support. Why Consider Vinyl Railing And Aluminum Railing Systems? 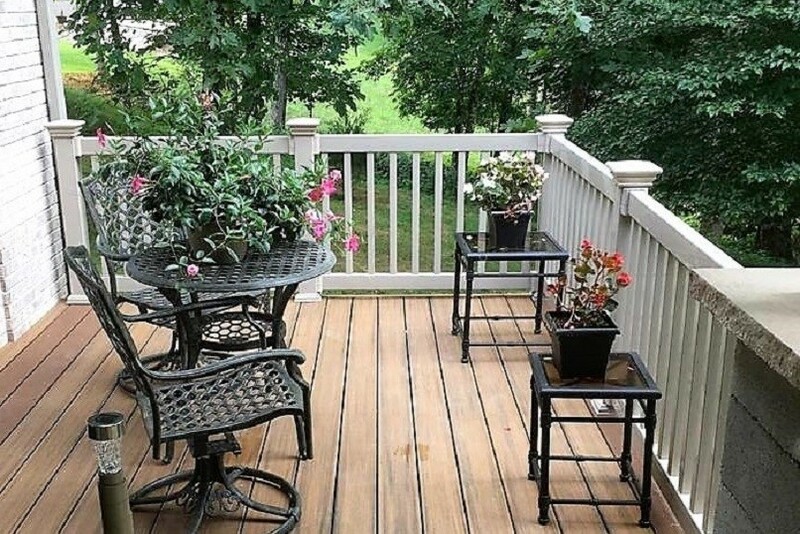 It can be hard to find a deck railing and stair railing that is perfect for your home. Wood is more high maintenance, and iron can be quite expensive. Two types that are gaining popularity for weatherability and minimal if any maintainance, is vinyl railing and alumminum railing. It comes in a lot of different styles and color. It is not too expensive and is shockingly low-maintenance. Vinyl and Aluminum railing can take a beating. It would probably surprise you to know that vinyl stair railings are about five times the tencile strength of wood railings. While wrought iron is stronger, with vinyl and aluminum, you will not have to worry about rust, or any rotting, peeling, or decomposing that can be risks with other types. Pests also don’t like it, so you can strike that off the worry list as well. With vinyl railing and aluminum railing, you do not need to worry about repainting or resealing anything. The color will stay vibrant throughout its life. In fact, cleaning it is remarkably easy. You can do it in minutes by spraying it down with a garden hose and soap and rubbing it with a sponge. As easy as that is looks brand new again! 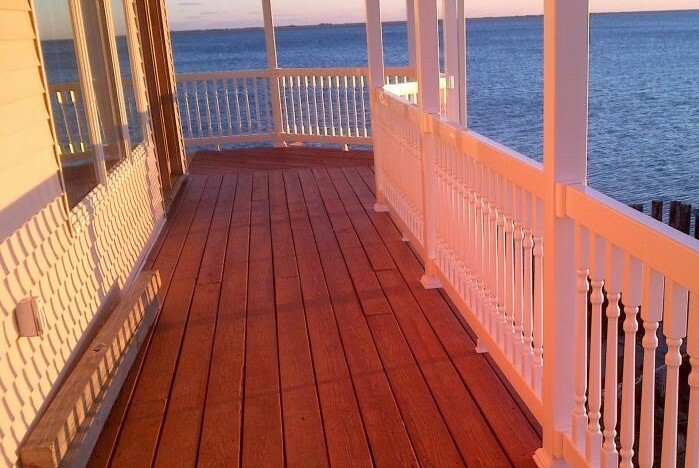 There are several ways that our deck railings and stair railings will save you money. They are so strong and they will last for a lifetime, meaning you will not have to pay for replacing your railing every 5-7 years. Our heavu duty vinyl railing and aluminum railing systems can also be quite simple to install, so installation costs are low. Better yet, you can even install the railing yourself by simply reading the instructions. Vinyl and Aluminum railings can provide you with a host of style options from which to choose. You can go with classic or modern lines, or even more traditional styles. It is up to you. You can choose not just the style, but colors as well, so you’ll be able to find something perfect for your home. You can even get vinyl railings that look like other types of staur railings, such as wood.